I found some free printables for this story on www.harpercollinschildrens.com. Click HERE for the picture above. 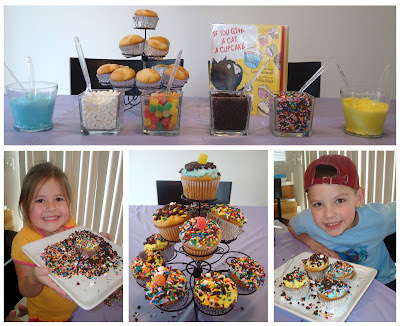 I set out markers, glittery pom poms, sequins, sprinkles, and glue for my kids to decorate the cupcakes. They both enjoyed this activity as well. This is one our finished cupcakes. I had to use hot glue to get the pom poms to stick to the paper. I thought these turned out cute! I printed off the activity sheets that went with this story. Then I printed a quick cover sheet in paint shop pro to create these little activity books. Click HERE for the printable activity sheets from Harper Collins. I have to admit I even had fun doing this activity.